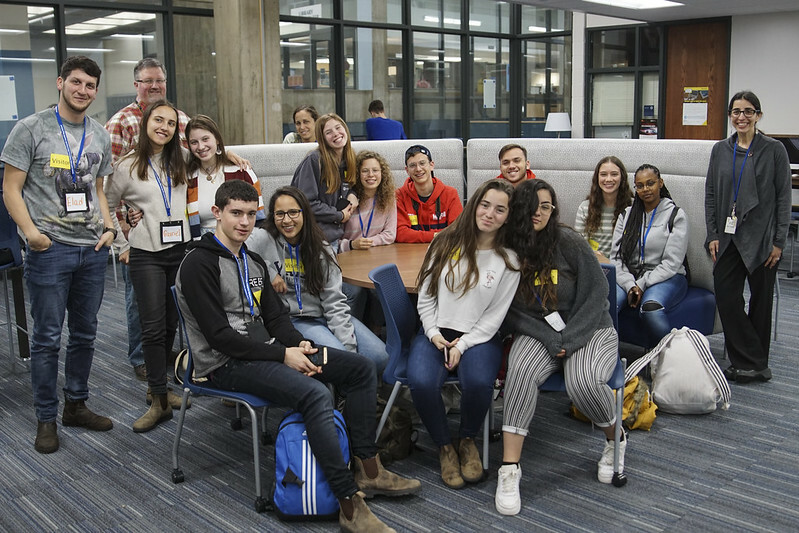 Ten students from Israel visited Hopkins High School as part of the Partnership2Gether program through the Israel Center of the Minneapolis Jewish Community. The world got a little bit smaller when ten Israeli high school students visited Hopkins High School on April 9. The group is visiting Minneapolis through a program called Partnership2Gether, which is through the Israel Center of the Minneapolis Jewish Community. The students are from Rehovot, Israel, a city located about 20 miles south of Tel Aviv. Rehovot is a city known for its commitment to science through the Weizmann Institute, its significant tech industry, and lots of culture and diversity. “Hopkins is about being World Class and global, so what better thing to do then to have more people from around the globe become part of our community,” said Rick Rexroth, Hopkins High School social studies teacher. Rexroth provided the visitors with a tour of the school including the theater, Lindbergh Center, and the band, choir and orchestra rooms. The Israeli students even stopped by a few classrooms where they had the opportunity to converse with some Royals. Visiting Israeli student Angie Dorfman was impressed with how big Hopkins High School was compared to her school in Israel. She said her school is much smaller and there are not as many electives to choose from. The main goal of their visit was to learn more about the American culture from the perspective of youth her age. “We just want to learn about the difference that the youth that is growing up has to deal with,” she said. The Israeli students were interested in learning how American students plot out their futures after high school. In Israel, when young people turn 18, they must serve in the Israeli Defense Forces. While American students can choose from entering the workforce, going to a university, or joining a job field, eleventh-graders in Israel are starting to think about their military service. This is the fourth year that a group from Rehovot has visited Hopkins. Rexroth has been involved with the cultural exchange from the beginning. He hopes to continue to evolve the partnership as the District works toward Vision 2031. “I would love to be able to foster more connections with more people from more countries,” Rexroth said.